Documentation of 'How To Talk to Strangers', Woolloomooloo wharf. Documentation of 'How To Talk to Strangers', Hyde Park. Documentation of 'How To Talk to Strangers', Pitt St Mall. Walking around Sydney, I was struck by the number of people passing by with headphones in their ears. It seemed that in this way people were able to refrain from engaging with or being engaged by their surroundings. 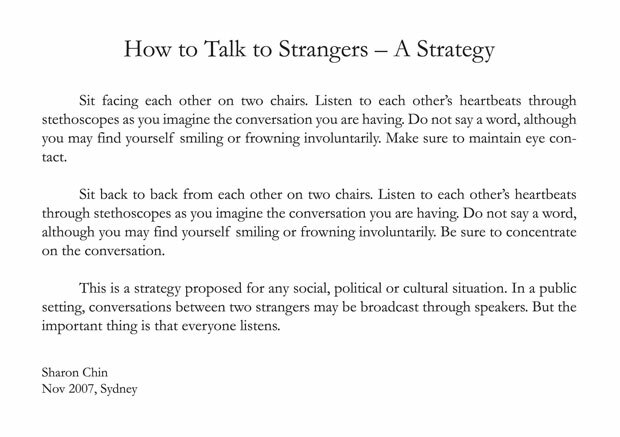 I tried to think of a strategy that would allow me to talk to strangers, not by speaking, but by listening. Sit facing each other on two chairs. 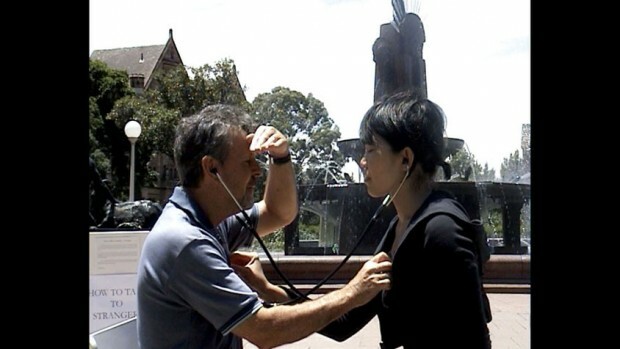 Listen to each other’s heartbeats through stethoscopes as you imagine the conversation you are having. Do not say a word, although you may find yourself smiling or frowning involuntarily. Try to maintain eye contact. This is a strategy proposed for any social, political or cultural situation. In a public setting, conversations between two strangers may be broadcast through speakers. This project was completed during a 3 month stay at Gunnery Studios under the Australian High Commission’s artist residency programme. Versions of this work have been shown or performed in The Independence Project at Galeri Petronas and Gertrude Contemporary, Melbourne in 2008, at Beyond Pressure International Performance Festival, Yangon, also in 2008.